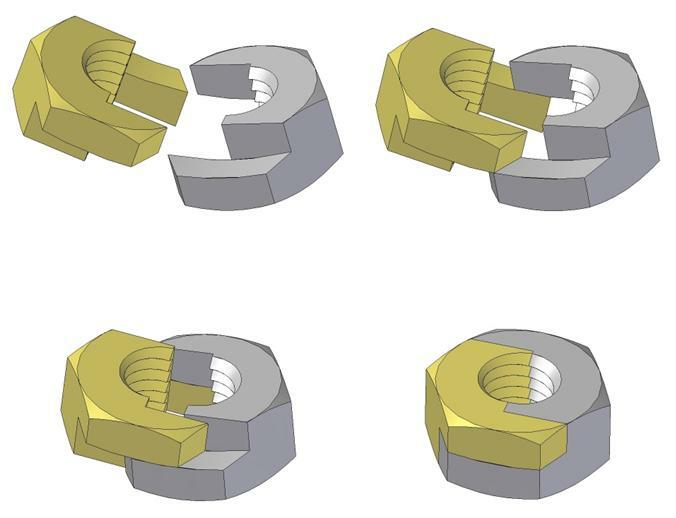 The operating principle of the TWINNUT is simple: two parts that are identical in their outward form, fit together with a pivoting movement along curved, one-sided guide surfaces. Each item has a half-female thread. In the standard version, the parts differ by half a thread. If the two parts together, the entire screw thread is used and achieves optimum strength. By tightening the TWINNUT the pivoting of the two halves is locked against each other. The parts cling to each other.